General practice (or general law practice) typically encompasses a broad range of practice areas by an attorney. We have settled personal injury and wrongful death lawsuits for over a million dollars. When you are searching for quality, experienced law service, look no further than Joslin & Moore Law Offices, P.A. of Cambridge. Partners Clark Joslin and Patrick Moore manage the practice. Joslin is a William Mitchell College of Law graduate who has practiced law in Isanti County since 1979. Moore is a graduate of the University of Iowa Law School who brings his CPA and tax counsel experience to the firm. Completing the team are legal assistants Dana Millsap and office manager Betty Stickels. Altogether, the members of Joslin & Moore bring personalized service and attention to detail for all their clients. 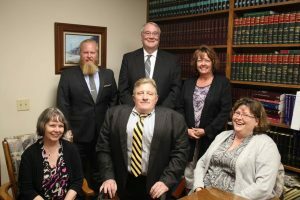 The firm handles a broad range of legal matters including estates, probate, wills, real estate transactions, business and tax law, family law, appeals, personal injury, criminal defense and litigation. The Cambridge office of Joslin & Moore, 221 2nd Ave. NW, is open Monday through Friday from 8:30 a.m. to 5 p.m. For more information call 763-689-4101. (front, l-r) Betty Stickels, Patrick Moore and Dana Millsap (back) Nicholas Anderson, Clark Joslin and Gigi Degnan.